point, which presumably is induced by the deposited Na. a general consensus about these findings [8-11]. 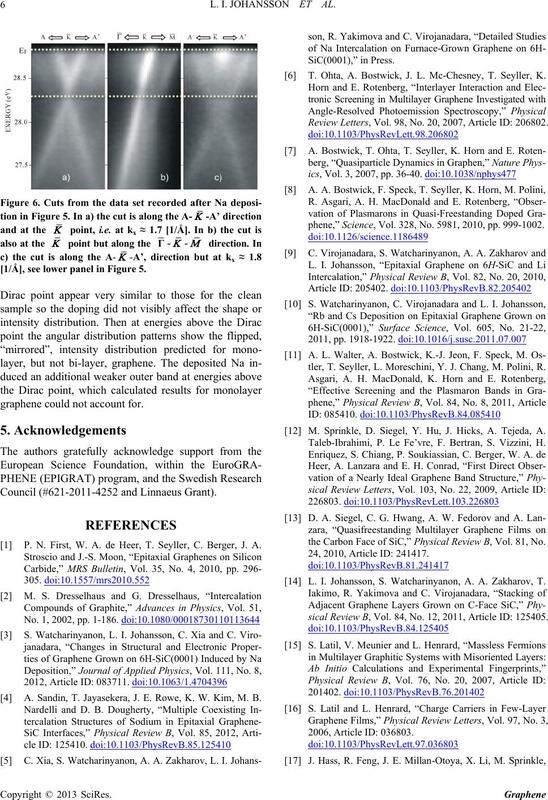 observed [12-14] even for multilayer graphene samples. L. I. JOHANSSON ET AL. have a higher density of defects on the surface. low temperatures range is therefore large, ca. ±25˚C. domains are seen to have different azimuthal orientations. is however discernable in these diffraction patterns. 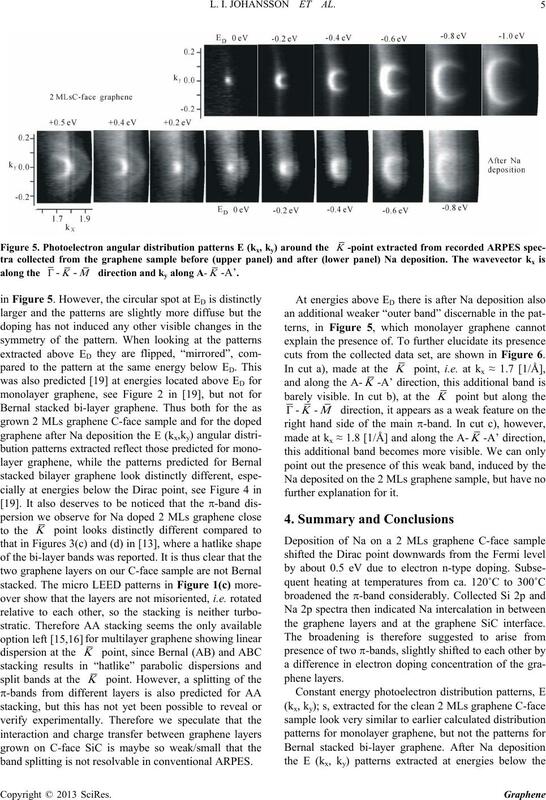 ple at three photon energies are shown in Figure 2(a). -point at a photon energy of 33 eV. 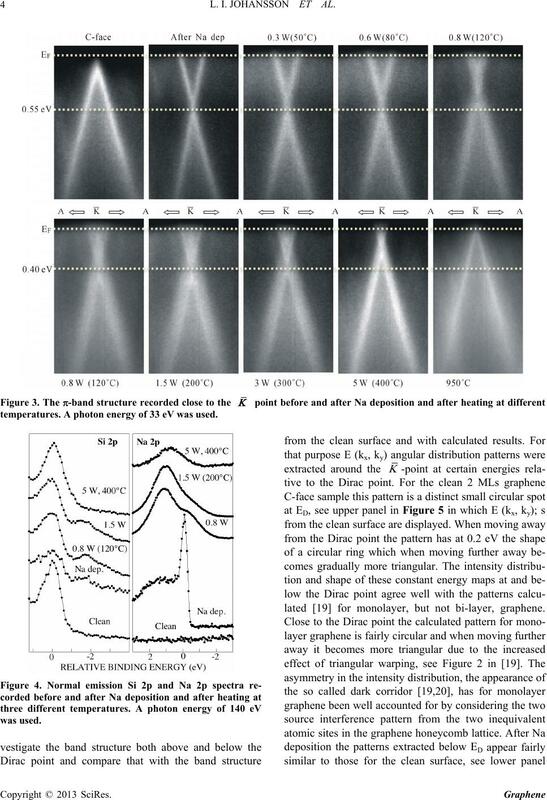 using a photon energy of 33 eV is shown in Figure 2(b). have desorbed, and at 950˚C the initial band is restored. that are observed particularly well at 200˚C and 300˚C. position and after heating at temperatures below ca. they provide support for the above speculations. temperatures. A photon energy of 33 eV was used. 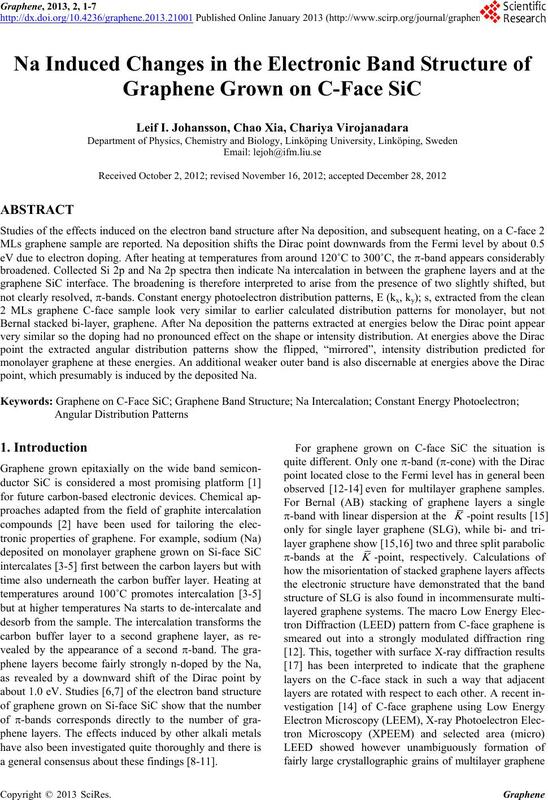 lated  for monolayer, but not bi-layer, graphene. band splitting is not resolvable in conventional ARPES. cuts from the collected data set, are shown in Figure 6.
the graphene layers and at the graphene SiC interface. 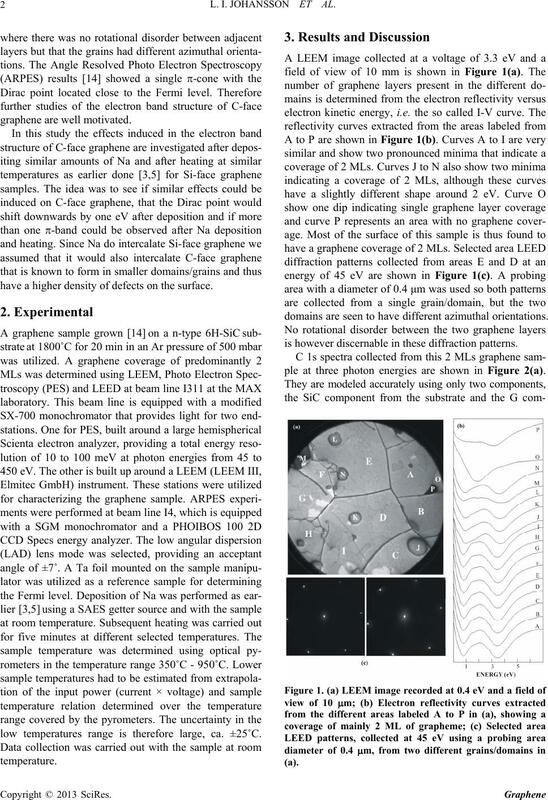 [1/Å], see lower panel in Figure 5.
graphene could not account for. Council (#621-2011-4252 and Linnaeus Grant). P. N. First, W. A. de Heer, T. Seyller, C. Berger, J. A. 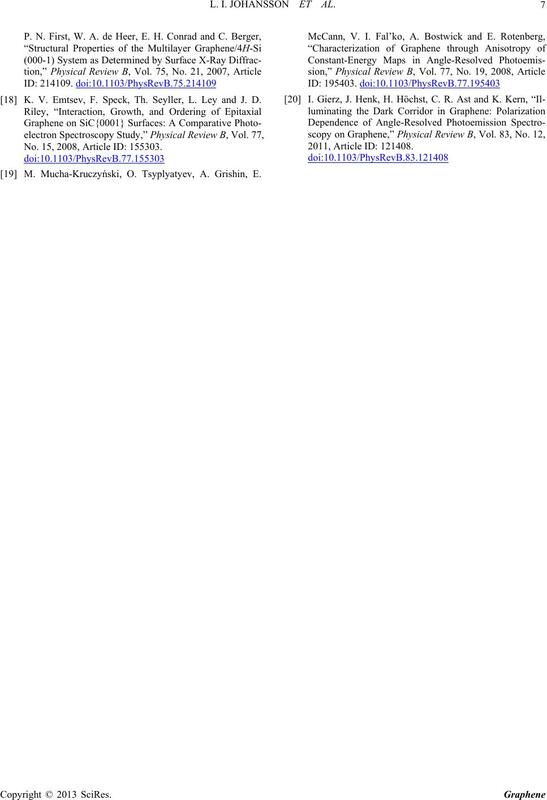 A. Sandin, T. Jayasekera, J. E. Rowe, K. W. Kim, M. B.
 T. Ohta, A. Bostwick, J. L. Mc-Chesney, T. Seyller, K.
Review Letters, Vol. 98, No. 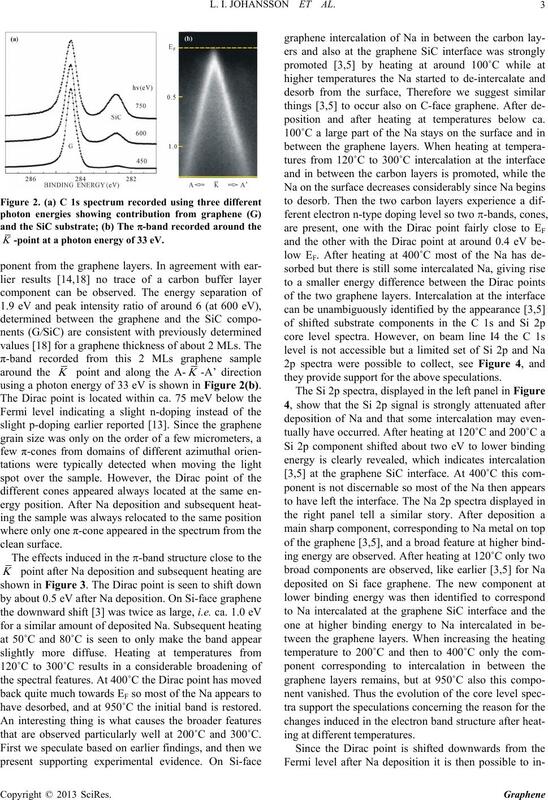 20, 2007, Article ID: 206802.
phene,” Science, Vol. 328, No. 5981, 2010, pp. 999-1002.
tler, T. Seyller, L. Moreschini, Y. J. Chang, M. Polini, R.
 M. Sprinkle, D. Siegel, Y. Hu, J. Hicks, A. Tejeda, A.
Taleb-Ibrahimi, P. Le Fe’vre, F. Bertran, S. Vizzini, H.
the Carbon Face of SiC,” Physical Review B, Vol. 81, No. 24, 2010, Article ID: 241417. L. I. Johansson, S. Watcharinyanon, A. A. Zakharov, T.
sical Review B, Vol. 84, No. 12, 2011, Article ID: 125405. K. V. Emtsev, F. Speck, Th. Seyller, L. Ley and J. D.
No. 15, 2008, Article ID: 155303. M. Mucha-Kruczyński, O. Tsyplyatyev, A. Grishin, E.